Basically you will need a ratio or 1:2, or twice as much Ginger Juice as Honey. There are several ways to make Ginger Syrup. Obtaining Fresh Ginger Juice may be a challenge, unless you have access to a juicing machine or extractor (the kind that separates the pulp) in which case you won’t have a problem. Here are a couple options. Either way you make it, the result is a wonderful syrup with a delicious and powerful ginger taste! Chop up a bunch of Fresh Ginger Root (about 1 cup) and blend in a food processor along with 1/4 cup water. Use as much water as necessary to keep the mixture moving and blending. Use cheese cloth to squeeze and strain out the water/juice mixture. Since the mixture will not be pure Ginger Juice, you’ll need to obtain extra liquid, about 3/4 cup. Transfer the water/Ginger Juice mixture to a pan and cook it on the stovetop with 1/4 cup rock sugar or 1/4 cup honey. Simmer and cook to boil down for 1.5-2 hours. Bottle in glass and store in the refrigerator. One of my teachers, Dr. Fu, would obtain Ginger Juice by mashing the Fresh Ginger in a large brass mortar & pestle. This was actually quite entertaining because it is so hard to do. He would climb on a chair to elevate himself enough to be able to use his body weight to pound the Ginger. Luckily we had everything set up on a very heaving duty old-fashioned wooden desk that could take the strain of all the mashing and banging needed to crush and extract the Fresh Ginger Juice. I don’t think this would work well with most mortar & pestles that are made of stone, but the large brass Asian ones work well for this exciting endeavor. Obtain juice from Fresh Ginger (Shēng Jiāng 生薑) by tossing in fresh ginger root and use the liquid it creates. You’ll need 1/2 cup juice. Transfer to a pan and cook it on the stovetop with 1/4 cup rock sugar or 1/4 cup honey. Simmer and cook for 45-60 minutes (or longer). Strain and keep only the Ginger-Sugar liquid. Bottle in glass and store in the refrigerator. 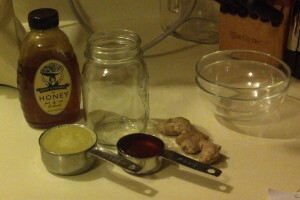 If you made your Ginger Juice with honey, the final product will have a thick, honey-colored consistency like in the picture to the left. You can strain it again with cheesecloth if you want it to look and taste more purified, though this is not necessary. If you made your Ginger Juice with rock sugar, the color will be lighter. The thickness of the final product also depends on how long you cook it to boil down the sugar. This entry was posted on Thursday, February 7th, 2013 at 6:26 pm	and is filed under Herbal Libations, Lung Remedies, Sweet Treats, Warming. You can follow any responses to this entry through the RSS 2.0 feed. You can leave a response, or trackback from your own site. I really like the recipes that you give us in our class . So far , I have made one of them with Sheng Jiang ( Ginger ) and Cong Bai ( Green Onion ) for early stages of cold and has done wonders for several of my friends . My plan is to try more of your recipes ( need to buy the herbs ) , so, I’ll keep you posted . great suggestion!! I’m wondering can I make Ginger Honey Tincture? just put the ginger into honey, let it sits for a month. If yes, will the ginger honey tincture performs same functions as the ginger syrup? Making a cold extraction of ‘Ginger Honey Syrup’ without cooking sounds great too. You could either make an ‘electuary’, which is a combo of powdered, dried herbs (in this case – Gan Jiang) stirred into honey (or vegetable glycerin) to form a pasty mass (thick enough so it won’t drop from a spoon easily). Store in a covered, glass container and dose by the teaspoonful. 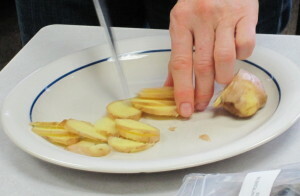 Another way would be to use fresh ginger (juice young ginger or mince the ginger into small pieces). Do not add any water. Cover with honey and let steep for at least a week. Taste a little of the ginger-honey at that point to check how strong it has become. The most medicinal honey would be labeled as ‘raw’ and ‘local’ which has the most amazing anti-bacterial, anti-viral, anti-fungal and immune boosting components. Hi Heidi: What about ‘Bo He’ Mint? That is a really good cooling digestive aid. Do you know if a little ginger juice be given to dogs? With lung issues and clear runny nose? Melissa: You could try mixing a little ginger juice (or sweetened ginger juice since it’s so spicy-warm) into the dog’s food. Great question! As you know most dogs tend to shy away from things that are super spicy and warm, prefering bland foods. But dogs do like SWEET! If the ginger syrup is too spicy try adding a little extra honey to tone it down for them and then mix into their food. I am thinking I might try and make this recipe by grating my ginger. I know this is a heck of a lot of grating, but the juice extracts nicely by squeezing grated ginger. I will play with it and see if it will work. I’ve started to cook all my stews with Sheng Jiang ( fresh ginger ) ,food taste so much better .Am I over doing it ? Does it have any side effects for toddlers ? My grand daughter likes to eat it fresh . American Gingseng ( Xiyang Shen ) moistens and its good to clear fever . Chinese Gingseng ( Ren Shen ) is my all time favorate , it’s been helping me to tonify my lungs and has helped me with my digestion ( st &sp ) . Also , great energy booster . Add two table spoon of Hu Lu Ba ( fenugreek seeds ) to chopped parsely , green onion , garlic , onion , salt & pepper , little bit of oil , some dry beans ( may be red kidney beans ) ,fresh lemon juice . Cook for 45 min . Add meat , cook longer . Here , you get your meal & medicine for back pain . I really like adding Sheng Jiang to my fresh green and fruit juices. With the weather becoming a little warmer lately it feels too hot to use Sheng Jiang all the time. Maybe there is another herb or veggie/fruit that can counteract the warmth of the ginger and still taste delicious with the juice? This is great to have around, I like to have a spoonful after taking my nasty tasting herbal decoctions! 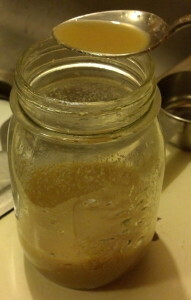 I just made some fresh Ginger syrup with rock candies ,super good . Got the Sheng Jiang fresh from organic farmers market in Brentwood , super good . From farm to my little hands . Used my juicer , mixed it wtth my rock candies ( some clear and some pink , yellow rocks ) . I filled three glass jars , the colors are so different because of my color rock candies . I also had some fresh Sheng jiang juice in a tall glass of water with some fresh Bo He to balance it . Good herb for good heath . Bo He is a wonderful addition. Thanks Lana for this recipe and Sai for the interesting additions :). or just add it to some soda water if you want something easier & faster. You can also use it to make chewy ginger candies by boiling it down even farther. Although I realize that eating ice cream often isn’t the best idea, it is a weakness of mine. When I cave to the craving, would this syrup be complimentary? It seems it would offset some of the negative effects of the ice cream because of it’s ability to harmonize the belly. That would be a good idea to add this syrup to the ice cream to warm up the belly. Another idea would be to sprinkle tasty Indian cardamon or Vietnamese cinnamon on top of the ice cream. I love homemade ginger syrup. I made whiskey gingers last Christmas with my grandma and everyone really liked them…maybe a little too much 🙂 We used 3-4 tablespoons ginger syrup, 2 cups club soda, a shot of whiskey and garnished them candied ginger slices. i haven’t tried it yet, but have read that if you freeze the fresh ginger and then heat it, it becomes easier to obtain it’s juice because the cell walls have become broken down. Obviously, this is more for those who do not have access to a juicer.